Ko Un is Korea’s world famous poet and certainly its most prolific with well over 100 books to his name. His magnum opus is Maninbo, translated literally as Ten Thousand Lives – 10 000 being a metaphor for very many in Korean – begun in prison (he has been thrown in jail many times, once sentenced to life) when he vowed to describe every person he had ever met. It is now 4001 poems long and mentions 5600 people. A dapper dresser, he is a spry octogenarian with an expressive face and seemingly ageless energy. It is hard not to smile in his company. Ko Un often speaks in poetic terms, further complicated in translation. Sometimes I have had to reach for the meaning. The interview was conducted through translator – his wife Lee Sang-Wha. Some slippage has likely occurred. BM: You grew up under Japanese imperial rule. I cannot imagine being forbidden to speak one’s language and having one’s name changed. Ko Un: I haven’t taken those facts of my life as a yoke or harness. However, all those memories still exist, strongly. It was a very shocking fact when I realised I should use a language outside my house, not the language that I learned from my mother’s breast. It was the same with our written language. It was also a shocking fact when I found out that my name should be changed … Every day we were forced to bow to the emperor of Japan. We could only whisper our own language among our families. And then, when Korea was liberated in 1945, I realised that liberation was also the liberation of my mother tongue. I could restore my old name, Korean name, and also the forbidden Korean language. Those facts influenced me as a poet. I am still very conscious of that and even take it as my fate to use my mother tongue. [So] every word of my mother tongue is itself of a poem or poetry before it is used in my poems. My heart begins beating when I move forward in my own language. BM: That makes me think of A Poet’s Heart – “out of all today’s truth seeping through the cracks in the evil and the lies, the poet forms one single cry. And other hearts beat it to death” … You are known for your political activism. You opposed the dictatorship of Park Chung-Hee [ruled Korea 1963-72]. Now his daughter is Korea’s first democratically elected female president. How does the poet respond in a democratic space? Ko Un: I think no era or age is guaranteed with happiness. In some respect, happiness is sleep; the opposite of happiness, unhappiness, makes people wake up from sleep. Ko Un: Dictatorships cannot be allowed anymore, as they were in the 70s and 80s. What I am concerned about under the current administration is that the most important problem of Korea, the division, cannot be changed, because both sides collide every time, and we cannot expect Korea to be united as we wish. Sometimes I doubt democracy, because voting produces a winner through the technicians of voting. Sometimes I’m worried that elections create another kind of coup d’etat. The poet has a job – to write poems in his private room, and also to read poems in public spaces. Poetry should try and combine those two. BM: And what can poetry do under a regime such as North Korea? Ko Un: I’ve been to North Korea several times. In 2000, I went as part our president’s retinue to the summit in Pyongyang. I met Kim Jong-Il at the state banquet and we drank wine together. I also read my improvised poetry. On that trip, I met some North Korean poets. Another time, I organised a meeting of poets north and south. However, I don’t know much about what they are writing. I know that they are not allowed to say anything about the system of the country in which they are living. For me the poets in North Korea seem very naïve [like] naïve religious people, because they shed tears not artificially, but truly from within, when they praise Kim Jong-Il and his father Kim Il-Sung. The politics in North Korea are the future for them. BM: Have you included Kim Jong-Il in Maninbo? Ko Un: So far I haven’t written about people from North Korea, except from our history, and before we were divided, I wrote many poems about the people there. After such a long time of division, the language has also divided. I’ve been working on a grand Korean dictionary, a compilation to lessen the gap between the languages. BM: Has European poetry influenced your work? Ko Un:It is unfortunate I haven’t had anybody influencing me in terms of writing poems. At one time I loved Baudelaire. I also love Omar Khayyám, Gilgamesh, Ramayana, but although I love all those poets from the earliest parts of the world, I don’t think I have been influenced by them, that is my unhappiness. I started to read Dante’s Divine Comedy in prison. I met all those great poets when I already had made my own house, so it was too late for me to accept them a the main pillar of my house, but I was very happy to receive them as guests. Korean modern poetry has only a history of 100 years. BM: Of which you are 80. 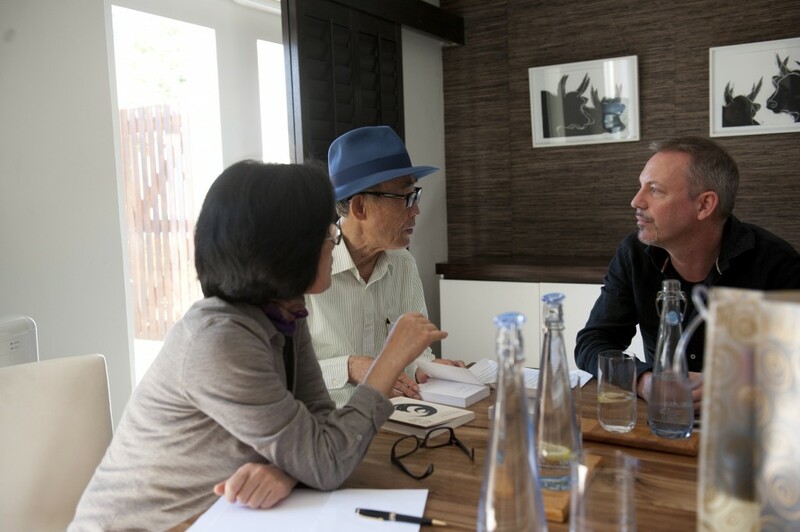 Ko Un: [laughing] That is why in my poems there is the beginning of modern Korean poetry, but also the adolescence and the youth after the child has grown up. Also, I think I have the blood of ancient people over immeasurable time flowing in my body. BM: You lived for a decade as a Buddhist monk. How did that influence your poetry? Did it help you in prison? Ko Un: When I was a baby I grew up on my mother’s breast milk. My tenure as a Buddhist monk was another sort of milk for me. I ate Buddhism. It has become a part of my bone, flesh and blood. I don’t know how I could have gone on living if I hadn’t met Buddhism. At the time I went into the mountains [Korean phrase for becoming a monk] it was after the Korean War in which millions of people had died. Even on my body, I had the smell of death. I actually tried to commit suicide several times. When I learned how to negate language and written language as a monk, and I concentrated on meditation, I could feel I changed and became another self of mine. Probably the insights in my poems, especially in the long narrative poems, could have been the result of what I did as Sŏn [Zen]. Buddhism denies the visible world …When I was young the negation of the world was appropriate to me but after that I left Buddhism behind, the affirmation of the world was more appropriate to me. But I wouldn’t like to say I am a Buddhist or that I’m one of the Buddhas as Nietzsche said he was the Buddha of Europe! I just want to be grass or a squirrel or a bird – the bird as a totem. BM: Does life get easier as one grows older? Sang-Wha interjects: A very dangerous question … for a poet. Ko Un: I always take precautions … I restrain myself from becoming comfortable as I grow older. I take it more meaningfully when my wife criticises me than when she praises me. I don’t want to go to some deep valley and sleep there. What I like most is the typhoon, the angry waves of the sea. However, I feel some kind of duty to the flowerbeds, the flowerbeds where butterflies are fluttering. BM: That answers my question. Ko Un: [laughs] Usually I don’t remember any of my poems, but it just occurs to me a very short poem called Echo. BM: I recall from Beside Sŏmjin River – “the nearby hills, sharp eared” … Once you’ve read it, you never forget that image. Ko Un recites. The whole register of his voice changes, it is rapid, staccato, yet musical, mimicking an echo. Ko Un: Someone goes up to the mountains at dusk and looks at the mountain ranges around and asks, who are you? And all he gets is [the echo] who are you, who are you, who are you. Eventually, the question and the answer that should be made disappear together. Then all that is left is the sunset flaming. Dancing in Other Words, an international poetry festival curated by Breyten Breytenbach, will take place at Spier outside Stellenosch on May 10 and 11. A short version of this interview appeared in the Mail & Guardian 10 May 2013. This entry was posted in Uncategorized and tagged Ko Un, Korea, poetry. Bookmark the permalink.